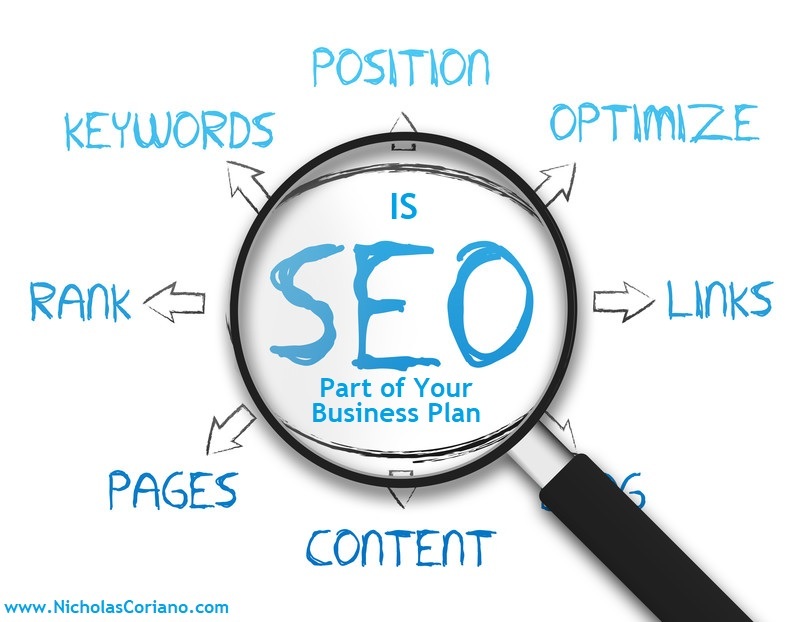 Nicholas G. Coriano: Is SEO Part of Your Business Plan? Is SEO Part of Your Business Plan? If SEO is not a part of your business plan, you may want to ask yourself why? As a professional business plan writer, I have dominated certain keywords on Google and these keywords bring me traffic, AKA potential clients. For example, currently I dominate the keywords Connecticut Business Plan Writer and New York City Business Plan Writer and Massachusetts Business Plan Writer and I am working on dominating other keywords that include the term business plan writer in them. To give you an understanding of where am I coming from, let me give you a quick rundown of how I learned about search engine optimization, SEO, about 10 years ago. While attending Law School, my computer was a bit old, to put it lightly. If I saved one more file on the computer it probably would have blown up. The truth is it was an old computer and I needed a way to save files without saving them on the computer. I had heard about this thing called blogging. As I understood it, you got to publish documents on the internet. And many of them were free. So I opened up a Blog to put my law school notes somewhere where I can find them all the time. After a year of taking notes in law school, I log back into my blog the following year and saw something surprising. For those people that blog, you already know that your blog will show you statistics for your traffic. I did not know this. When I logged into my blog, I saw that people had been searching for topics related to the notes I was taking in law school. It clicked in my head. What if I could write articles that allowed people to find me from all over the world, and when they do find me, I could sell them a related service or product? So at first I tried it with a website called Cervitude.com and my goal was to dominate the keywords microcap investor relations. This went exactly as planned. I dominated the term on search engines and I began getting phone calls. Soon after that, I started with keywords on this website NicholasCoriano.com and beginning to dominate terms like business plan writer and the geography, as stated above. So is SEO part of your business plan? If it's not, in most cases it should be. Here are a few tips on how to increase your page ranking on Google, Yahoo, Bing and other search engines. These tips will also give you some ideas on what not to do. Write about something you enjoy. If you don't enjoy it, it's going to get tough when you just have to do it for SEO sake. Make sure you focus on certain keywords. This means have an objective for which keywords you are trying to dominate. Put them in your titles, your urls, and save any picture you put in the blog post or website as that keyword. All the content you put out matters, so anytime you play something on your website or blog make sure you have your key words in focus. (For example, the picture in this blog post was saved as "SEOBusinessPlanWriter.jpg"
Don't spam. Don't just write articles to write articles, and don't just put up web pages that don't add value to your website. When you are writing your content, regardless of whether it's a website or blog, be authentic and right what's necessary. You don't want to stuff a bunch of keywords into your website or your article thinking that Google will read it and give you credit for these keywords. What all the technology companies do is look for authenticity. No matter what the system says today, eventually it's looking for the most authentic, reliable, information filled, non-spammy websites. Backlink your website or blog post. If there is another website somewhere that happens to reference your website, and point out the keywords in that reference, this will increase your search engine optimization. This is because search engines, like people, give more weight and credibility to something that has been referenced buy another authority. For example, when I had an article "Cervitude partner Nicholas Coriano eager to assist aspiring entrepreneurs" published in the Fairfield County Business Journal, with a link to my the Cervitude.com website, it probably gave me a little boost in SEO for Cervitude.com. Above and beyond the weight that search engines will give you for search engine optimization, this is also a good idea because it drives traffic from other websites to your website.